This is mainly a photo report. We had six people on the Gold Coast team this week. 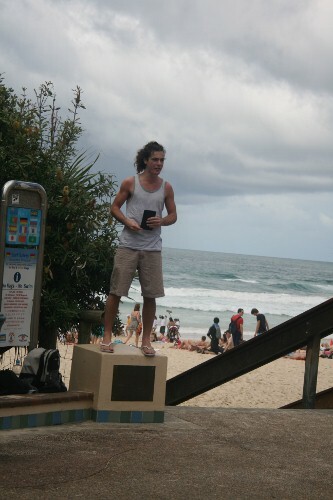 Josh Williamson, Joel Barnard and I took turns preaching at Surfers Paradise, while the rest of the team handed out tracts and talked to people. Even though it was cloudy for parts of the afternoon, various people stopped to hear the preaching and many good one2one conversations were had. Praise the Lord! 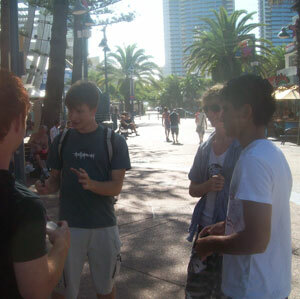 The sun was shining and it was rather busy at Surfers Paradise as Joel and I walked up through Cavill Mall. As we waited for others to arrive, we continued handing out gospel tracts and witnessing to people. I had quite a few good conversations with people, one was with two teenage boys who after going through some of the 10 commandments with them, realised that they deserved Hell. So I explained the cross and what they must do to be saved, however they said they would rather have more fun now than repenting and putting their faith in Jesus. So I gave them an analogy to think about. I said, "Imagine if you were in a house and you noticed it caught on fire. You either have the choice of running out the house and avoiding the pain of getting burnt and dying, or you could just keep sitting there, saying, "I'm having too much fun in the house to escape the flames" I asked them what would they do. They said that obviously they would run out of the house. So I pointed out that regarding life, they are in the same predicament. For the flames of Hell are coming closer and closer to them, for the amount of time they have left living on this Earth is getting less and less. So they have the choice of saying, "I'm just going to enjoy life and then receive the eternal torment in the flames of Hell", or escaping the flames by turning to Jesus Christ in repentance and faith. That is, not trusting in anything good they've done to get them to Heaven, but instead putting their full trust in Jesus' death to save them on the Day of Judgment. The boys then understood the importance of the decision they have to make. Please pray that God will draw them unto Himself. Once Andre arrived, we had a time of prayer and then I stood up to preach. Almost immediately a bunch of teenagers jumped out of the bushes and started to listen and heckle. I went through the good person test with them (using God's law), in order to bring the knowledge of sin. During this time, a rather large crowd had gathered to hear the dialogue taking place. I explained the cross and the resurrection to the crowd, pleading with them to turn to Christ in repentance and faith. One of the teenagers called out by saying that the Bible is all a fairy tale. So I asked him, "Point to one thing in the Bible that is a fairy tale". He responded by saying, "In the book of Genesis, it talks about a man that has a Lion's head. That's clearly a fairy tale". I pointed out that nowhere in Genesis does it talk about such a man. He insisted, so I said, "Here is my Bible, please look it up and show it to me." He admitted He didn't know where it was and conceded the point. After preaching the gospel numerous times, I stepped down from the preaching spot and Andre got up to preach. He talked about the judgment that will come to all after death, and God's standard in which He'll judge them. And because of our sin, we all deserve Hell. He then went on to explain that that is the precise reason why Jesus died, to save His people from the consequences of their sin. After Andre got down, Jamie joined us for the remainder of the outreach and we all continued witnessing one2one with people and handing out gospel tracts. Both Joel and I ran out of gospel tracts by the end of it, but Andre had some spare, which was good. Many seeds of the gospel were planted today. To God be the glory! 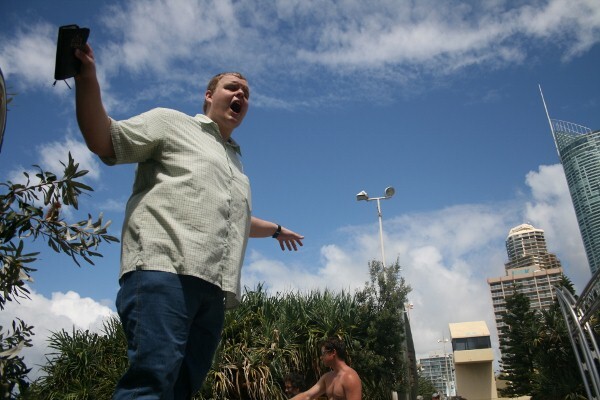 Jason Lamont, Joel Barnard and I made our way to the usual preaching spot at the top of Cavill avenue. On the way we started handing out gospel tracts to everyone we met, and had a few brief witnessing encounters with people. When we arrived, we had a time of prayer, to remind us that God is the one who is sovereign in salvation. 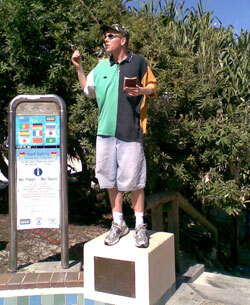 I stood up to preach first, and after a while, a small crowd gathered. I asked a couple of the people listening whether they thought they were good people. I went through some of the commandments with one fellow, and he admitted to breaking them. He understood he deserved Hell, but after I preached about how he can be saved from his sin, he was really interested. He said he would really think about the gospel that he heard today, and he received a gospel tract. After about an hour of preaching, I tagged Jason in to preach. He did a good job explaining the judgment to come, sin, and the wonderful news of the gospel. During this time, a mate of mine named Jerram arrived and was keen to witness. 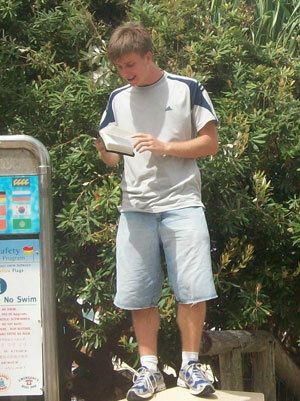 It was his first time evangelising on the streets, but after receiving a bunch of tracts, I turned my back for a moment and he was out of sight. 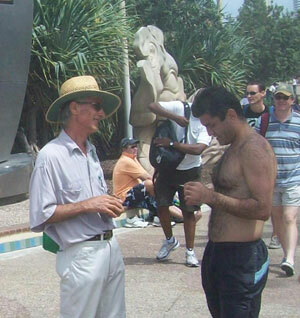 It turns out he had walked up and down the path that runs parallel to the beach handing out tracts to everyone he met and starting up conversations with people. Joel also, for the whole time, was handing out gospel tracts and having witnessing encounters with people. Right when Jason finished preaching, it started to pour down rain. So we went undercover and continued to hand out tracts there. At 2pm, we thought we might start heading back to the car since it was still raining. But on the way back, Joel and I started up a witnessing encounter with a mother and her daughter from Melbourne, who were holidaying at the Gold Coast. At first, the mother was saying that she will get to Heaven because she's a moral person. But after going through a few of the commandments, she agreed that she wasn't really moral. She was a Roman Catholic, so she thought that the fact she tries her best, God would have to make an exception for her and let her into Heaven. So I showed her where in the Bible it says we are saved by grace through faith alone (Ephesians 2:8-9). After 30 minutes of discussion, she seemed to understand the gospel message, and why the blood sacrifice of the Son of God was necessary to forgive our sins. She then said that she now has put her trust solely in Jesus' death to save her on the day of judgment. Praise God. In the meantime, Joel was chatting to her daughter and she seemed to have a bit of trouble understanding the gospel message. She kept bringing up objections at every point and it seemed like her heart was very hard. But she said she now has many things to think about because the extensive conversation. Just before we reached the car, we noticed a large line of youths waiting at a bus stop. There was a concert on that day and they were trying to get there. So we decided to give them all gospel tracts. However, we had each run out of tracts from the outreach. So we returned to the car and picked up some more and handed them out. Many seeds of the gospel were sown today. 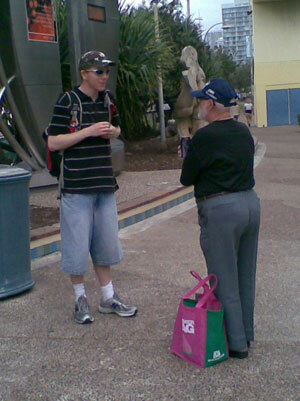 Tim, David Strachan, and I arrived at the coast and as we walked to Cavil Avenue, we started handing out gospel tracts. This lead into quite a few witnessing conversations with people. One in particular was with a guy who responded by saying he's broken so many laws, when we asked, "What law do you think everyone in the world has broken?" We explained that the only law (or group of laws) that every single person in the world has broken is the Ten Commandments. So I went through a couple of them and he admitted that he had broken them. He understood that he was deserving of Hell. So I explained the gospel to him, but he said he wouldn't repent and believe because he wants to get his just deserts. He said that in life he would rather receive the consequences of his actions, and not be let off the hook. But I explained to him that that is foolish and he doesn't really hold that philosophy in life. For I got him to imagine that if his job wasn't paying enough money to provide food on the table for himself or his family, and so some people were offering food to him. I asked him, would you accept the free food or let you and your family die? He said that he'd obviously accept the food. So in the same way, I explained, we deserve to be sent to Hell for eternity and Jesus is offering forgiveness if we repent and trust in Him. Why would you reject His free gift? And this gift is much greater than simply food, as this has eternal consequences. Due to the fact that by the time we arrived at Cavil Avenue, it was already late. We decided to not preach today and simply continue to hand out tracts and witness to people. I was able to witness to the Meter Maids briefly, many gospel tracts went out. 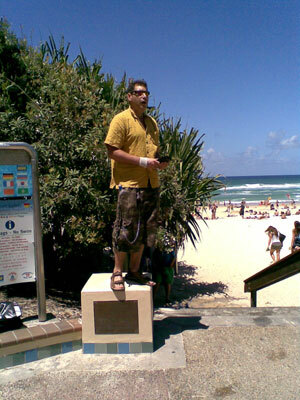 Jason, Markus, and I met under the Surfers' Paradise sign ready to proclaim God's Word at the Gold Coast right on noon. We firstly prayed, and then I got up to preach. A small crowd gathered and the people sitting on the all the various seats in hearing-range listened to the message being preached. However, there was no one who wanted to heckle. I called out to a young man that was listening whether he thought he was a good person, he said yes, however as soon as I mentioned some of the commandments, he ran away as the conviction of sin he did not like. After expounding on the law and the gospel numerous times, I stepped down and tagged Jason in. He spoke about the temporality of this life and the fact that the judgment follows it for every single person. During this time a group of guys stood there intently listening. One even decided to record the message on his phone. A few of them tried to mock the message, but Jason reminded them that what you sow, you will also reap one day. The law and the gospel were also clearly explained to them, so I pray that God will grow the seed that has been planted in their hearts. After Jason got down, I got up to preach and tried to engage this group of guys. One of them was willing to see if they were a good person, and he soon realised he wasn't. So I explained that the Jesus Christ came to die on the cross to take the punishment we deserve in Hell, He can take it on the cross for us. But we must repent and trust in Jesus' death to save us on the Day of Judgment to receive forgiveness of sins. 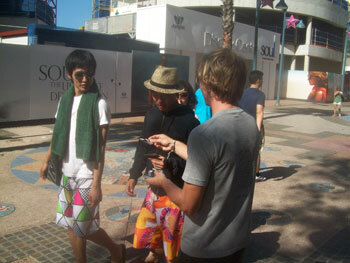 After I got down from preaching, Jason and I joined Markus handing out gospel tracts and witnessing to people one2one. Jason had a good conversation with a person who was a Roman Catholic. Jason explained that contrary to the Roman Catholic teaching, the Bible actually says we are saved by grace through faith alone. No one is required to take part in any of the sacraments or other good works to be saved, they are simply a natural response to genuine faith. He also talked about the idolatry of Mary in the Vatican's teaching, and what the Bible says about it. The man seemed to understand what Jason was saying and he was very thankful for the conversation. He said he had never really heard that before and said that he would really investigate these things. Please pray that God will convert this man. 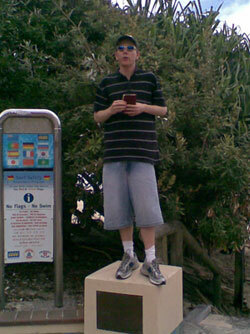 During this period of time, Jamie arrived at the Coast and joined in witnessing to people. He had a very extensive conversation with a person who was brought up Roman Catholic but now had his own religion. So Jamie presented the law and the gospel to Him, and I pray that God will convert this man from his work-righteous religious system. 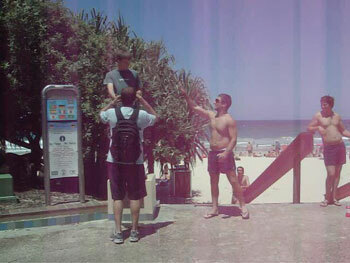 Many people were out and about at Surfers today. 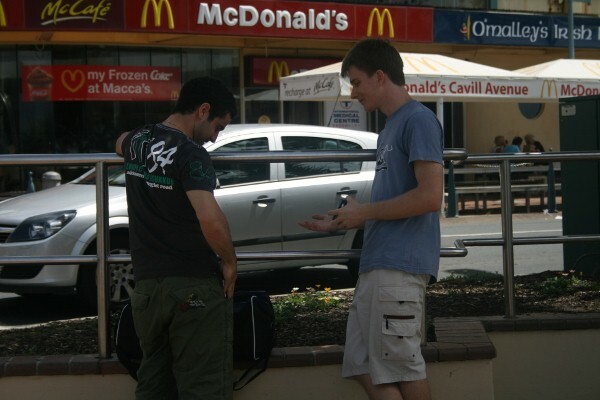 Ryan and I handed out heaps of gospel tracts to people before we arrived at our preaching spot where we met Marcus. We were a team of 3. Over the course of the afternoon, each of us handed out hundreds of gospel tracts and people. Most people were responsive. I chatted with 2 guys who hold to humanism. Unfortunately I didn't get to challenge them with the gospel, but they took and read the gospel tracts I gave them at least. I did get to challenge 2 guys who hold to Islam. They were actually really friendly, great blokes to talk with. As I challenged them with what Jesus said - that he is the only way. They couldn't believe that Jesus was God or anyone more than just a prophet. May God 'grant them repentance leading to a knowledge of the truth' (2 Timothy 2:25). Ryan and I took turns preaching. We interacted with a few people in the crowd. Mark 12:25 For when they rise from the dead, they neither marry nor are given in marriage, but are like angels in heaven. ...And then, much to the relief of one of the guys there, I said that this does not mean that we will be ghosts or a chubby babies in diapers playing harps for all eternity, but rather we are told that we will have real glorified bodies. One of the blokes asked if there will be death in heaven. I said that the bible tells us that every tear will be wiped from our eyes - there will be no suffering or death in heaven but we will be given glorified bodies that are imperishable. 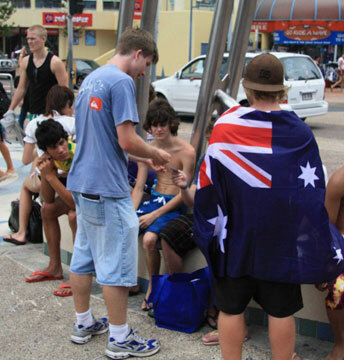 Since it was Australia Day, I knew that it would definitely be busy down at Surfers Paradise. So Peter Webber and I made our way down to the coast. We noticed that many people were dressed up in national colours and a lot of people put flags outside the windows of their cars. 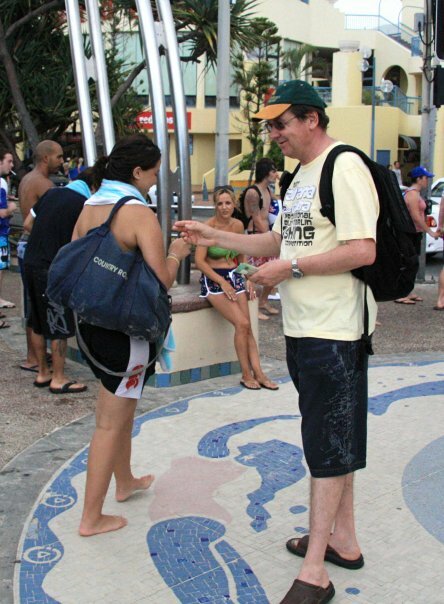 So once we arrived, we started handing out gospel tracts to every one we met. 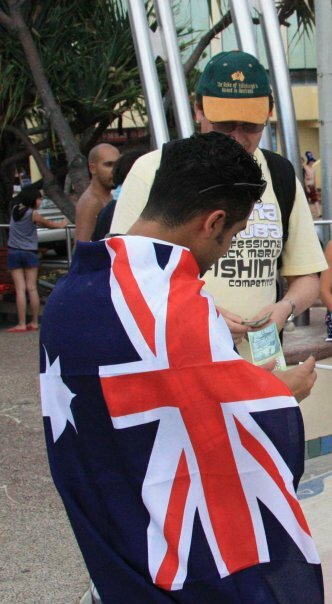 Big Money and Million dollar notes worked very well because people saw it as a novelty note for Australia Day. So many people came back asking for more for their friends. After a few witnessing encounters, I stood up to preach and nearly instantly people started to heckle. Within minutes a crowd of about 100 people had started to gather as they listened to the preaching. I ran the good person test through a couple of most vocal hecklers, and they recognised their helplessness towards God. They knew they deserved Hell. I then preached the cross of Christ and how one can be forgiven of their sins. Since more and more people were joining the crowd, I made sure I went over the law and gospel again, elaborating on certain parts, to make sure the message stuck in their heads. None of the hecklers had anything meaningful to say though. They were just amazed that someone would do stand up and preach like this. 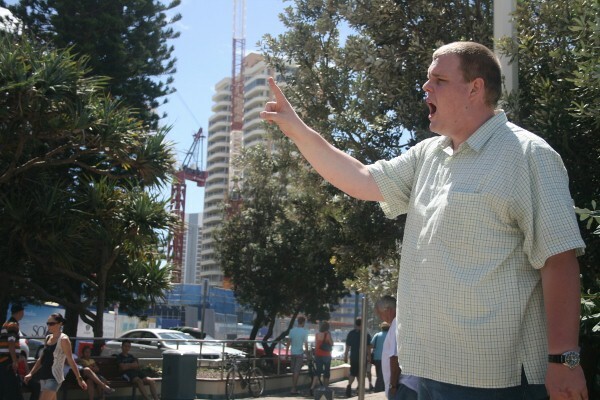 One guy decided to pick me up off the place where I was standing and move me 5 metres away, after which I simply went back and started preaching again. 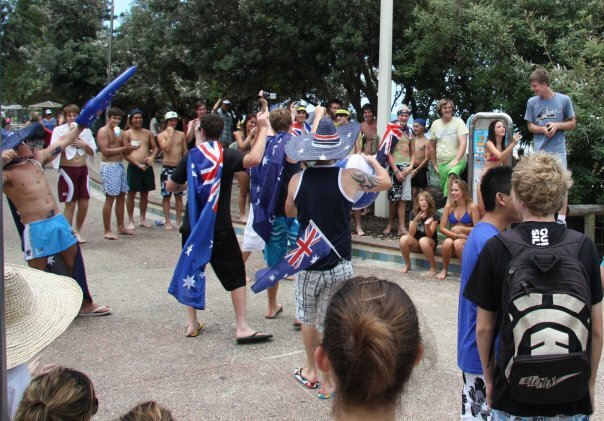 At one stage, in order to drown out the preaching, a group of guys started saying "Aussie, Aussie, Aussie", at which the crowd joined in with "Oi, Oi, Oi". Then everyone proceeded to sing the national anthem, but instead of making the preaching stop, they simply attracted more people to find out what was going on. So that once they had finished singing, I simply resumed preaching saying that even though it is great to be an Australian, even Australians will die one day. And after that comes the judgment. I praise God for bringing in all these hecklers, as they attracted more people to hear the gospel message. I had the usual things thrown at me, like beach balls and thongs, but this time I also had a blow-up kangaroo thrust into my face. I also got soked with Coca-Cola, which some guys thought would be funny to do. However, all it did was add more credibility to the message, because the people listening saw that I was willing to keep preaching this message, even when things like that were done to me. For Jesus' words ring out so clear: "Do not fear those who kill the body, and after that have nothing more that they can do." (Luke 12:4) All an unbeliever can do is kill the body, so there is no reason why we shouldn't share our faith. After an hour of preaching, I stood down and had numerous people thank me for the message I was preaching. Even non-Christians came up to me saying, "Look, I don't believe your message, but man, do you have guts. I'm really going to think about what you said." Others who said, "Your message has changed my life." Praise God. We then did some further one2ones and tracting with the people there. After my voice had recovered, I stood back up to preach and God again brought in a massive crowd to hear the gospel. This time, some of the hecklers had some questions, like "Where did God come from? ", "How was the world made?" So I spent a little bit of time answering those questions. There were a couple people drinking beer as they listened. They tried offering me a beer and a cigarette in order to distract the preaching, so I proclaimed to them that "What will it profit a man if he gains the whole world and forfeits his soul?" (Matt. 16:26). I asked the whole crowd whether they had lied, stolen something, looking with lust. They all said they had. I pointed out that it makes them deserving of Hell. I then explained why our good works can't credit us salvation, and that salvation only comes through Jesus Christ. At this stage I saw two policemen start to cross the road towards me. They stood in the crowds for a couple minutes, so I thought they were simply going be my protection if a heckler did something to me. But instead, they came up to me and said that because people were putting beer bottles and cigarettes in my face, they were going to have to move me on. I asked, "What don't you simply move along the people who are doing those acts, as they are the ones breaking the law?" They simply said no. So I said that we have permission from the council and from one of the members of Queensland Police. The officiers just said, "No you don't", and they didn't even want to check with the people who had given us permission. Then they gave me a move on order. However, even during the dialogue with the police, the crowd kept listening. It added further credibility to the message I was preaching, as they knew I would stand strong to the gospel message even though the police regularly moved us on. But thankfully, when we got moved on was just about when I was finishing preaching anyway. 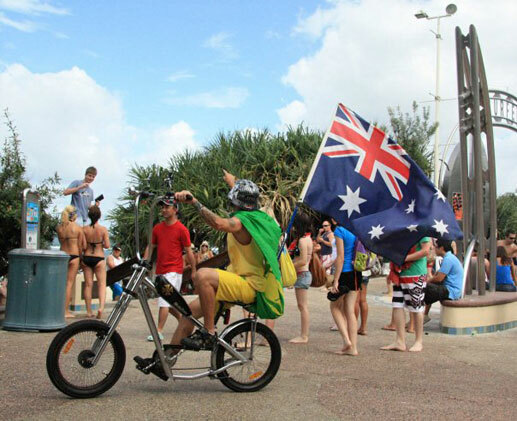 So praise be to God that both Peter and I were able to spend many hours on Australia Day witnessing to the people of the Gold Coast. Please pray that God will convert the people who heard the gospel message. Since I knew that I was unavailable to lead the Gold Coast team on Saturday, we decided to have it on Friday instead. It was very busy at the Gold Coast, even though it was a week day, which I suspected was because it was still school holidays. After arriving to the coast, we spent a few minutes in prayer and Bible reading together. We then moved to our regular preaching spot and we noticed that there were a bunch of construction workers sitting underneath the tree next to where we preach. So I got up to preach and not long after I started preaching, a guy heckled me saying, "I can prove the Bible is wrong in 2 minutes." I wanted to find if this guy was religious at all, in order to know where he was coming from. However, he didn't want to answer any my questions. He just kept wanting to get his 'special' argument out, that apparently disproves the Bible. His argument when along the lines of "There are thousands of people who don't believe the Bible, therefore it is wrong." Obviously this argument is fallacious, as it's simply an appeal to popularity. So I went onto talking about what the Bible says is to come after we die, and that is the judgment. The lad didn't like hearing about. I proceeded to ask the people in the crowd whether they had broken any of the 10 commandments. The common response came back that they all thought they were good people. So I went through some of the 10 commandments with them to order to bring the knowledge of sin. This lead into the gospel message about how we can be forgiven of our sin if we repent and trust in Christ's death alone to save us. The construction workers and a lot of the crowd stayed for pretty much the whole time I was preaching. I pray that God will convert them using the seed that was planted in their hearts. After I got down from preaching, David Strachan got up to preach. 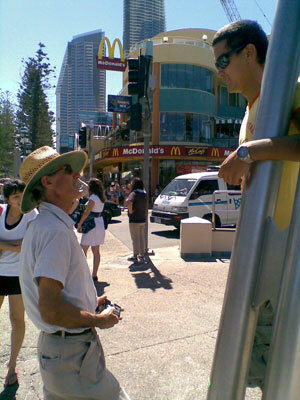 He did a great job making known to the people of the Gold Coast about Christ and Him crucified. 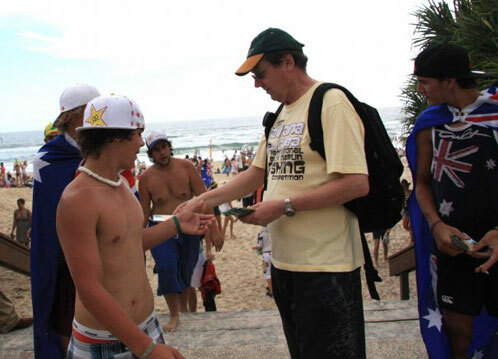 I praise God for Dave's commitment on being a regular witnesser on the Gold Coast team. We encouraged Rachel to also have a go preaching open-air. And after a little bit of deliberation, she was up there preaching the judgment to come and the wonderful news of the gospel. I think that was her second time preaching open-air ever, and she did a great job. Many seeds of the gospel were planted today. Please pray God will convict those people of their sin and draw them onto Himself. Ryan and I were a team of two today. 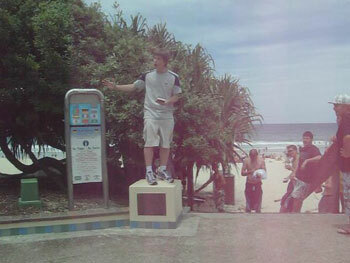 It was a real privilege to proclaim the gospel to many lost soul's at Surfer's Paradise for the glory of God. When we arrived, two young men opposite where we parked our car were doing some advertising for a night club. We went over and handed out gospel tracts to them. Ryan began sharing the gospel with them. One of the guys professed to be an Atheist and said that if someone is smart then they believe in science and in evolution. While Ryan was patiently sharing the gospel and answering the many objections that the young man had, his main argument was that he needed proof. He asked, "How can anyone believe in something they can't see?" Ryan answered that even though we did not see World War 2 occurring, we would be right in believing that it occurred, due to the evidence that supports its reality. Similarly, we have not seen Jesus, but there is good evidence backing up the things that He did. The other young man had been raised in a Christian environment but had given it up when he had grown older. He said that the main reason was that he simply wanted to be himself and have fun and that he could never live up to all the rules of Christianity anyway. 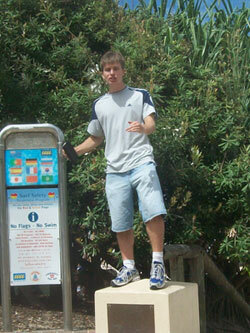 As Ryan reasoned with him and shared the gospel, he raised a number of objections which he felt quite strongly about. One was that (according to him) there is no way that God could save someone who sinned all their life and got saved on their deathbed. He said that a person who does many good things for God all their life should definitely get into heaven regardless of whether they believe the gospel. He also objected that we all really believe in the same God anyway. Ryan answered these questions succinctly and effectively, keeping the focus on the gospel. The second young man softened after a while. He even admitted that he was convinced that evolution is absurd, even though he had a degree in Zoology (much to his friend's displeasure it seemed). 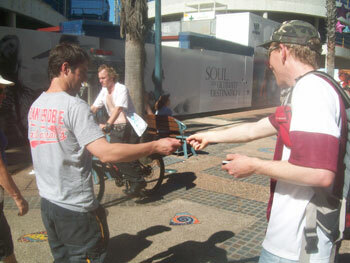 We then left the two blokes and handed out lots of gospel tracts as we walked to our usual preaching spot. When we arrived we spent some time praying. 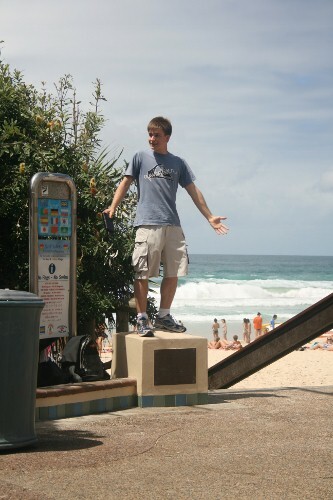 I then set the camera up and Ryan began preaching. 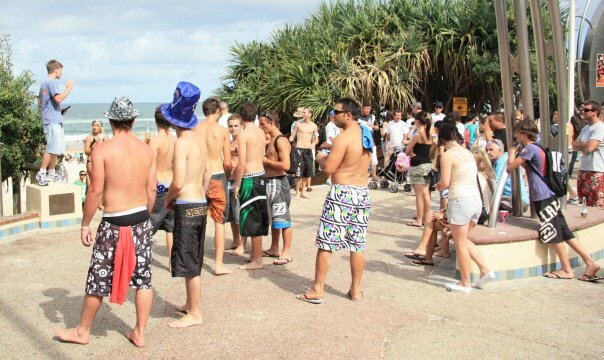 Ryan soon had a crowd when some guys who were drinking and chilling on the beach together came over to listen. Ryan interacted with them for quite a while, answering their objections and proclaiming the gospel to them. At the end of his preaching, Ryan encouraged people to pick up a bible and read it for themselves. He then thanked those listening and got down. Then when I was about to get up to preach, a policewoman and two Policemen came over and told us to move along. Apparently some people were offended at the message we were preaching. Seeing as though that is not a real law they can get us on, Ryan asked, "So if we can get moved along because someone was offended at us, can I not say: 'I am offended at all the scantily clothed women around here, so will you move them along as well?'" 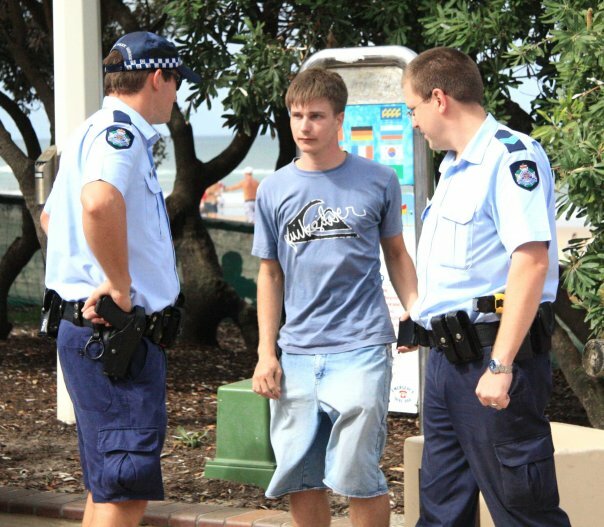 One of the officers replied, "Don't come to the Gold Coast if you don't want to see them." 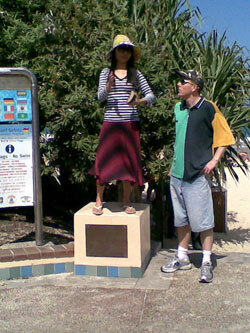 By the same token, could I not say: 'if someone doesn't want to hear preaching, they shouldn't come to the Gold Coast'? The officers saw their double standard and didn't want to continue chatting about it. One of the police officers asked, "Why do you do this, seeing as you're so young? If I was your age, I would be partying." We briefly explained our motivations and gave them gospel tracts. Praise God for the Gospel which is 'the power of God for salvation to everyone who believes' (Romans 1:16). The sun was high in the sky and the temperature was soaring. Another beautiful sunny, hot and humid Australian day. What more could we expect, it is summer and the people were out and about. Dave Strachan was the first preacher up for the day, he stood to preach in the blazing sun, and began to expound on who God is. Dave has written out some notes for him to preach from, so he went through those a few times. The crowd seemed a bit slow today, I would put this down to the heat. But it was good to see a few people stop to listen to the gospel. After Dave finished preaching, it was my turn to stand up and preach. I started off by talking about Christmas, and how many people love the idea of having a day off, but they don’t stop to think about why we celebrate. This then launched into a sermon about why Jesus had to come to earth 2000 or so years ago. While I was preaching this man walked by, he had no shirt on and he was really well built. He had so many muscles that his muscles had muscles. He was a tank. This man was furious at what I was saying, so he turned to me and pointed at me. As he pointed he began to yell, “It is because of **** people like you that other **** people don’t believe in **** God!” He then turned and began to walk off, so I challenged him, I called out after him, “Sir, do you believe in God?” The man once again began to curse, and then affirmed his belief in deity. So I asked another question, “Are you a Christian?” The man began to seethe in anger, he turned to me and his face was red. “**** you! **** you! **** because of you people don’t believe!” Again, I repeated my question, “Are you a Christian?” To this the man began to swear and say that he was a Christian. I then turned to him, and declared, “It is not because of preachers that people aren’t Christians, it is because of hypocrites like yourself that people hate Jesus Christ. You say one thing, but your actions show you are not a Christian!” At this all the mans veins began to stand out on his neck, and his friend had to restrain him, the man yelled, “**** YOU! I AM GOING TO PUNCH YOUR **** FACE IN!” A few people stopped to watch, so I said, “Go ahead, punch my face in, show everyone how much of a Christian you are, show people the love of Christ as you beat down a preacher.” The man turned and stormed off. From there I began to preach on how one becomes a Christian, and how we cannot just give God lip service. 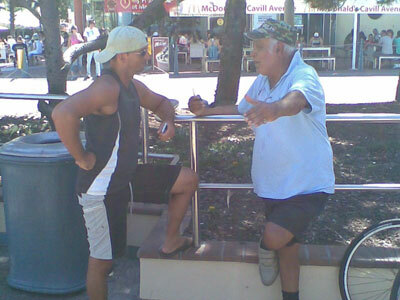 After I finished preaching I was able to have some great one to one conversations. One encounter was really good, but the problem was the man I was speaking to only spoke Farsi, so I witnessed to him via his translator. At the end of the conversation the translator declared herself to be a Muslim, and stated that Australia will belong to Islam one day. Overall the day went quite well, many heard the gospel.